I am quite a stickler for organized spaces and cleanliness. If my desk has a little too many documents sitting around, I can’t work till I organize the mess. At home, I often get into these cleaning moods and start swiping all surfaces, including the ceiling, floor and table tops. Yet, even I hate to tackle the gross scum that glues on to glass shower doors. Cleaning this surface is one of my worst nightmares because it feels like the filth meshes into the glass and is impossible to remove. Soap buildup and hard water deposits allowed to accumulate on a glass surface can cause etching over time and this permanently damages your glass. No amount of rubbing can clear up the permanent etching. To avoid long-term damage to your glass the best strategy is to wipe down the glass with a microfiber cloth or squeegee after each use. If you are anything like the average person though, there is a film of crust on your glass shower doors that needs deep cleaning. Remember we are living in the 21st century and the environment matters greatly. This cleaning job can be taken care of without the use of heavy chemicals that are harmful for our ecosystem. Quantities will vary based on the size of the surface area you need to clean. Follow the simple steps below to get your glass shower doors to sparkle. Mix half a cup of baking soda with a little water so that you end up with a thick foamy paste. Using your mixture, wipe the glass with a non-abrasive sponge. Leave the liquid on the glass for a couple of minutes to let it cut through the grime. Now you can’t just stop here. 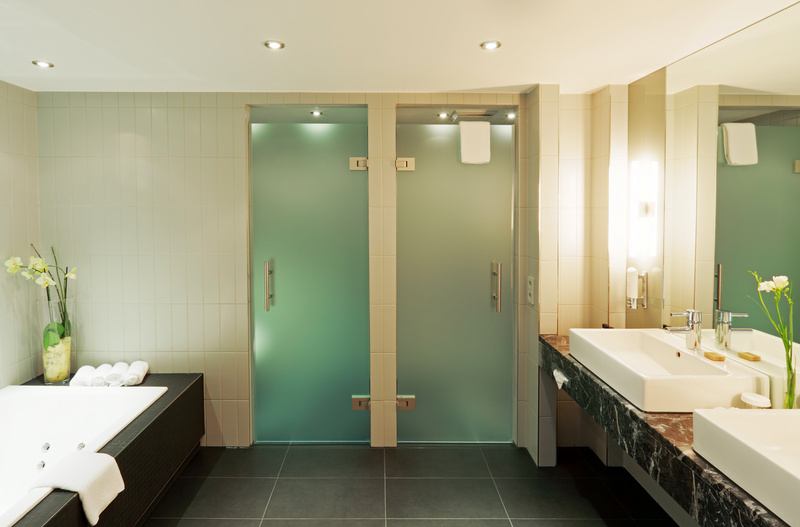 You cannot only clean the shower doors and leave dirty metal tracks the glass doors slide in. The metal tracks can be difficult to clean because the narrow space won’t allow your bulky fingers to wipe off the filth. There’s a simple solution for this bothersome problem. All you have to do is plug all the crevices and holes in the track and subsequently fill up the track with vinegar. Let the vinegar work its magic overnight and you can rise to shine early next morning with a simple wipe. After all this work, you deserve a nice, comfortable, hot and clean shower!